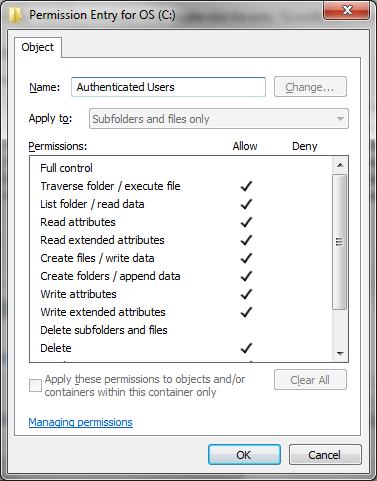 I've right-clicked the backup folder, gone to Properties >> Security >> Edit permissions, and clicked "Deny" under the "Write" permission for users belonging to the Users group. Upon further investigation, I discovered that if I log in as Admin and try to write a file to the restricted folder, I can't. Denying Write perm for the Users group also denied it for the Admin account. This is probably why my backup job is failing. 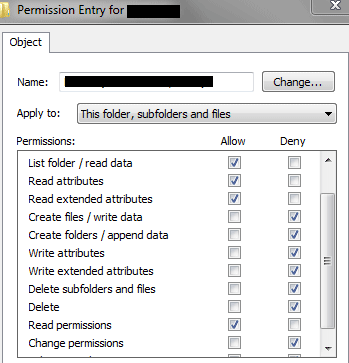 The image below shows the Effective Permissions for Admin after I deny write permissions to the Users group. I also discovered that although blocked accounts could not save a new file to the folder, they could still delete the files already present. So I was still vulnerable to malware deleting these files. I needed more restrictive permissions. I also need to find a way to deny perms for all non-admin users, but allow it for admins. Instead of denying permission for the entire Users group, I decided to try denying permission for only the account I use day-to-day. Most importantly, I denied all Write, Delete, Change permissions and Take ownership permissions. Now things seem to be working as intended. With my day-to-day account I can neither write, nor delete files in the backup folder. However as Admin I can do both. A manual backup just completed successfully as well so things seem to be OK. I'll know tomorrow whether the scheduled task runs without trouble. What I'd like is for all non-admin users to be restricted. My solution blocks just one non-admin -- MyPC\John -- but if another non-admin profile were created (or maybe even if my username changed?) the restrictions would be bypassed. I'm looking for something closer to the protection on C:\Program Files directory: I'm always blocked from making changes there if I'm not an admin. Instead of trying to block certain user accounts, just give permissions to the accounts you want to run the backup task. You can allow the entire Administrators group, or only certain administrative accounts to run the backup tasks. In other words, there's no reason to DENY any account, or group of accounts, because they will already be denied if there's no entry in the permission list giving them access. “Deny” is very dangerous. If a user / process has both “allow” permission and “deny” permission, it is denied access. The problem here is that your Admin account is covertly a member of the Users group. You can see this if you run whoami/groups from a Command Prompt running as Admin. (You may find the output more readable if you type whoami/groups /fo list.) I say it “is covertly a member of the Users group” because I found two or three other ways of checking which users are in which groups, and they didn’t show that the Admin user is in the Users group. “Authenticated Users” have a lot of access! Use kreemoweet’s answer. 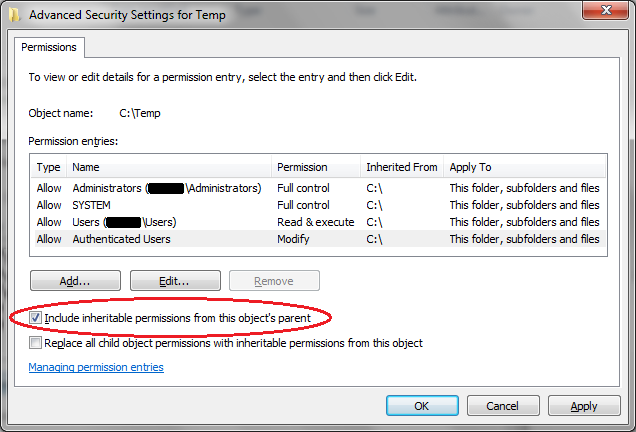 But first, figure out why you have write permission to F:\Files. Look at its permissions , and those of the root directory, F:\. Look for “Everyone” entries and “Authenticated Users” entries, and find the entry that’s giving you write permission (through checked “Allow” checkboxes) and uncheck them. Do not check “Deny” checkboxes. select “Add”. You should now see that all the permission entries for F:\Files are “<not inherited>” copies of the entries that were there before. Now you’ll be able to fully and freely edit those permissions, and uncheck the boxes that are giving you write access. 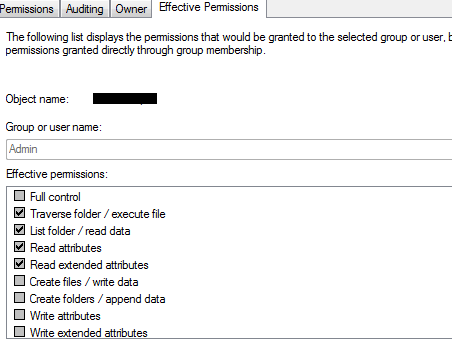 Then, when you’ve turned off write access for non-administrator users, go in (to the same ACL; i.e., for F:\Files) and add an entry to give write access to the “Administrators” group. I haven’t tried this, but: in addition to the “Admin” account you created when you booted into Windows for the first time, there is a builtin account called “Administrator” that is disabled and hidden by default. Instructions to unhide and enable it are easy to find, here on Super User and elsewhere. You might find that “Administrator” is not a member of the Users group, and that you can run your backup as “Administrator”. But try kreemoweet’s answer first; I don’t know whether this one will work. Not the answer you're looking for? Browse other questions tagged windows-7 security backup permissions scheduled-tasks or ask your own question. How can I run a Task Scheduler job without being on administrator account? Cannot get program GUI to appear when run elevated by Task Scheduler - is that expected?